CanPlay Casino wants to roll out the red carpet for players and treat you to 10 FREE SPINS on the $1,000,000 Slot Machine! All you have to do is register for a free account and you’ll get 10 chances to win $1,000,000. No deposit required! This is just one of the many perks to being a CanPlay Casino player. Check out our other player promotions and bonuses and sign up today. The Sign-up Bonus consists of 10 Free Spins on the CanPlay Casino $1,000,000 Slot Machine. The Sign-up Bonus is only valid for new players registering on CanPlay Casino. 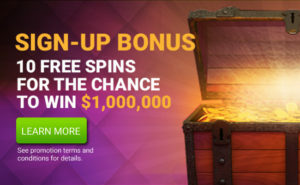 For more information on CanPlay Casino’s Free Daily Spin for $1,000,000 promotion click here. 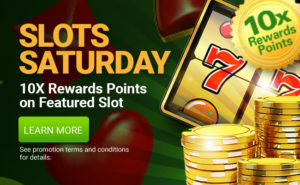 CanPlay Casino reserves the right to change or cancel this promotion in its entirety at any time. CanPlay Casino also withholds the right, at its discretion, to exclude any individual or individuals from participation. Players who have already signed up for a CanPlay Casino account are not eligible for the Sign-up Bonus. 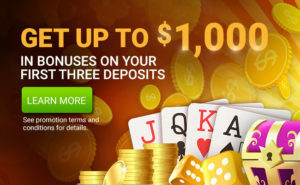 * The Sign-up Bonus is only valid for new players registering on CanPlay Casino.